The Audi A6 is an executive car made by the German automaker Audi, now in its fifth generation. As the successor to the Audi 100, the A6 is manufactured in Neckarsulm, Germany, and is available in sedan and wagon configurations, the latter marketed by Audi as the Avant. Audi's internal numbering treats the A6 as a continuation of the Audi 100 lineage, with the initial A6 designated as a member of the C4-series, followed by the C5, C6, C7 and the C8. The related Audi A7 is essentially a sportback (fastback) version of the C7-series and C8-series A6, but is marketed under its own separate identity and model designation. All generations of the A6 have offered either front-wheel drive or Torsen-based four-wheel drive, marketed by Audi as their quattro system. Second- and third-generation A6 models have shared their platform with the company's Allroad models. Both petrol and diesel versions of the A6 are offered. The wide range of engines available have power outputs ranging from 150 to 333 hp (112 to 248 kW). These are inline 4-cylinder 16-valve turbocharged engines and more powerful 3-litre units in a V6 configuration with a mechanical compressor. Audi's executive car was previously named the Audi 100 (or Audi 5000 in the United States), and was released in three successive generations (Audi C1, Audi C2 and Audi C3). In 1994, the latest generation (C4) of the Audi 100 received a facelift and was renamed as the Audi A6, to fit in with Audi's new alphanumeric nomenclature (as the full-size A8 had just been introduced). The exterior was changed only slightly from the "C4" Audi 100 – new front and rear lights, new radiator grille, similarly with chassis and engine and transmission choices. The United Kingdom was the first market to receive the A6, as stock of RHD Audi 100s had run out before expected, and before the rest of mainland Europe. The new engines for the A6 were 1.8-litre 20v inline four-cylinder, 2.0-litre 8v inline four-cylinder, 2.6-litre 12V V6 and 2.8-litre 30v V6 petrol engines, with the 2.3-litre inline five engine being dropped on most markets. For the diesel engines, an inline four 1.9 Turbocharged Direct Injection (TDI), and the inline five (R5) 2.5 TDI (103 kW (140 PS; 138 bhp)) were available. Until 1997, the A6 came with several different engines, two of them turbodiesel, and most of them available with Audi's Torsen-based quattro permanent four-wheel drive system. The A6 was available with saloon and Avant bodies. Upon introducing the C4 series A6, Audi made small revisions to what was previously known as the Audi S4, renaming it the Audi S6; the S4 name would eventually be re-used for a completely different model derived from Audi's smaller Volkswagen Group B platform-based Audi A4. As this was the first S6 model from Audi, it is commonly referred to as the Ur-S6, derived from the German augmentive, "Ursprünglich" (meaning: original). It was available as both a saloon/sedan (typ 4A5), and an "Avant" (typ 4A9) (estate/wagon) to European and United States customers, but only as a saloon in Canada, Asia and Australia. From its launch in late 1994, the Audi S6 was powered by a 2,226 cubic centimetres (135.8 cu in) turbocharged inline five-cylinder petrol engine (parts code prefix: 034, identification code: AAN) with a Bosch Motronic electronic engine control unit (ECU), producing a motive power output of 169 kW (230 PS; 227 bhp) at 5,900 rpm and 326 N⋅m (240 lbf⋅ft) at around 1,950 rpm, on high octane "Super Plus" 98RON unleaded petrol. This engine gave the S6 a top speed of 235 km/h (146.0 mph), and allowed it to accelerate from 0 to 100 km/h (62.1 mph) in 6.7 seconds; with 160 km/h (99.4 mph) being reached in 17.5 seconds. The vehicle was available with a standard six-speed manual transmission (five-speed only in North America), and Audi's dynamic Torsen T-1 quattro permanent four-wheel drive system. Audi made a high-performance, 4.2-litre V8 engine (parts code prefix: 077, identification code: AEC) with a Bosch KE-Motronic ECU available as an option in the original European S4s, and made the decision to continue to do so with the S6, making a 213 kW (290 PS; 286 bhp) version of the 4.2 available as an optional upgrade over the 2.2-litre inline five-cylinder turbo. Unlike the five-cylinder turbocharged version, the V8-powered S6 was supplied with a four-speed automatic transmission as standard, but kept the quattro four wheel drive. A six-speed manual gearbox was also available as an option. As a swan song to the C4 platform, an even more powerful, and very limited-production Audi S6 PLUS was briefly available to European customers. 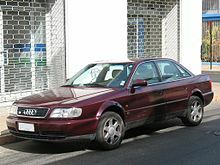 The S6 PLUS, developed by Audi's wholly owned high performance subsidiary, quattro GmbH, was available for sale during the 1997 model year only (production from June 1996 to October 1997). A total of 952 cars were produced–855 Avants, and 97 saloons. It was powered by another version of the 32-valve (four valves per cylinder) 4.2-litre V8 engine (parts code prefix: 077, identification code: AHK, later to be seen in the Audi S8 as AKH). Audi's performance division reworked key parts of the engine, increasing the maximum power to 240 kW (326 PS; 322 bhp). It was only available with a revised six-speed manual transmission (parts code prefix: 01E, identification code: DGU) (gear ratios – 1st: 3.500, 2nd: 1.889, 3rd: 1.320, 4th: 1.034, 5th: 0.857, 6th: 0.730), with a final drive ratio of 4.111. Further revisions were made to the suspension, brakes and wheels. The front brake discs were enlarged to 323 mm (12.7 in) in diameter by 30 mm (1.18 in) thick. Standard wheels were 8Jx17 "Avus" cast aluminium alloy wheels, with an optional 7Jx16 alloy wheel for use with winter tyres was also available. With so much power on tap, the S6 Plus saloon could reach 100 km/h (62.1 mph) from a standstill in 5.6 seconds, with the Avant a tenth of a second slower at 5.7 seconds. In February 1997, the introduction of a new A6 (Typ 4B), based on a new design automobile platform – the Volkswagen Group C5 platform, with a new range of engines was announced and appeared in March at the 1997 Geneva Motor Show. This new A6 moved up a notch in quality, and was marketed in the same categories as the BMW 5 Series and the Mercedes-Benz E-Class. The redesigned body presented a modern design, with a fastback styling which set the trend for the Audi lineup, and gave the relatively large saloon an aerodynamic shell with a low coefficient of drag of 0.28. In 2000 and 2001, the "C5" A6 was on Car and Driver magazine's Ten Best list. This new A6 was available with a wide range of engines and configurations. The 30-valve 2.4- and 2.8-litre V6 engines represented the bulk of the A6's development programme, with a multitude of other engine configurations available throughout the globe. As an alternative to the manual transmission, a five-speed tiptronic automatic transmission was also available. The C5 saloon variant arrived in mid-1997 in Europe, late 1997 in North America and Australia, and the Avant in 1998. In Canada, there was no Avant (Audi's name for an estate/wagon) available at all in 1998 – Audi dropped the C4 Avant at the end of the 1997 model year, and jumped straight to the C5 Avant in 1998 in conjunction with its release in the US. As a result of complying with FMVSS, the North American models were equipped with front and rear bumpers that protruded several inches further than their European counterparts, with modified brackets and bumper suspension assemblies as result, and child-seat tethers for occupant safety. In compliance with Canadian law, Canadian models received daytime running lights as standard equipment. North American C5 A6 models received the 2.8-litre, 30-valve V6 engine, the 2.7-litre "biturbo" V6 (also found in the B5 platform S4, 250 PS (180 kW; 250 hp)), and the 4.2-litre 40-valve V8 petrol engine (300 PS (221 kW; 296 hp)); the two higher-spec. engines were only offered with quattro permanent four-wheel drive. The V8 models arrived with significantly altered exterior body panels, with slightly more flared wheel arches (fenders), revised headlamps and grille design (before being introduced in 2002 to all other A6 models), larger wheels (8Jx17-inch), larger brakes and Torsen-based quattro permanent four-wheel drive as standard. In 2002, the A6 received a facelift, with revised headlight and grille design, exposed exhaust tips, and slight changes to accessory body moldings, and tail light colour from red to amber in North American models. A new host of engines were also introduced. The 1.8-litre engine was deleted and replaced by a 2.0-litre powerplant with 96 kW (131 PS; 129 bhp). The 1.9-litre Turbocharged Direct Injection (TDI) was tweaked to produce a maximum power output of 96 kW (131 PS; 129 bhp), and 310 N⋅m (229 lbf⋅ft) of torque, and was mated to a six-speed manual gearbox. The 2.4-litre V6 gained an extra 5 hp and better balancing, and the 2.8-litre V6 engine was replaced by a 3.0-litre engine with 162 kW (220 PS; 217 bhp). The turbocharged 2.7-litre was revised, resulting in 184 kW (250 PS; 247 bhp) and 330 N⋅m (243 lbf⋅ft), controlled by standard quattro system. The V6 diesel was also slightly modified resulting in 120 kW (163 PS; 161 bhp) (after the second modification) and 350 N⋅m (258 lbf⋅ft). A new more powerful V6 diesel was also introduced with 132 kW (179 PS; 177 bhp) and 370 N⋅m (273 lbf⋅ft). The 4.2-litre V8 engine which arrived in 2001 remained unchanged. Also new was the multitronic continuously variable transmission, available in most front-wheel drive models. All models, except the 2.0-litre petrol and 1.9-litre TDI, were available with Audi's trademark four-wheel-drive system, quattro. A four-wheel-drive version of the Avant, with raised ground clearance and slightly altered styling was sold as the Audi at quattro, Audi's first crossover SUV. The second-generation A6 was on Car and Driver magazine's Ten Best list for 2000 and 2001. 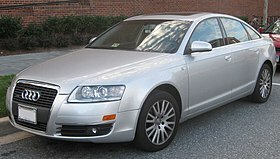 The updated 2005 A6 won the World Car of the Year award for 2005. In addition, the facelifted third-generation A6 3.0T won two Car and Driver "comparos" that pitted it against other sedans like the BMW 5 Series, Mercedes-Benz E-Class, Jaguar XF, and Infiniti M.
The Audi S6 was a high-powered variant of the A6, featuring a modified version of the 4.2-litre V8 engine producing 250 kW (340 PS; 335 bhp) and 420 N⋅m (310 lb⋅ft). It was available as a saloon and Avant although the Avant version was the only one sold in North America. In the late years of the A6 C5 design, an ultra-high-performance limited-run Audi RS6 model was presented. Weighing in excess of 1,840 kg (4,057 lb) and producing 331 kW (450 PS; 444 bhp) and 560 N⋅m (413 lbf⋅ft), the RS6 was capable of 0-100 km/h (62.1 mph) in 4.5 seconds, and on to 200 km/h (124.3 mph) in under 17 seconds. 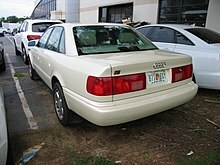 Initially available as only an Avant, a saloon variant was later added; the saloon version being the only version available to the North American market. The RS6 saloon finished first in a May 2003 Car and Driver comparison test against the BMW M5 (E39), Mercedes-Benz E55 AMG (W210), and Jaguar S-Type R.". Audi's C5 series A6 Avant formed the basis for a semi-offroad model in 1999, labeled "Audi allroad quattro". Compared to the regular A6, the allroad featured an advanced air suspension system, allowing for increased ground clearance; larger wheels with all-terrain tyres, and flared and unpainted bumpers, giving it a distinct appearance and more overall flexibility over varying terrain. As the name "allroad quattro" suggests, Audi's Torsen-based quattro permanent four-wheel drive system was standard equipment for all versions. The standard adjustable air suspension system can lift the car high enough to provide 208 mm (8 in) of ground clearance; a low-range mode (an option with manual transmission), absent from other quattro-equipped vehicles, can be selected with the touch of a button. When used together, the two systems made it possible for the allroad to complete an official Land Rover test-course, thus far it is the only car-based SUV that has been proven capable of doing so in testing. Conversely, the air suspension can lower the vehicle down to only 142 mm (6 in) above road level, and simultaneously stiffen the spring and damper rates to provide a sporty driving experience, much like that of the conventional A6 with the sports suspension. Audi's 2.7-litre, twin-turbo V6 petrol engine with 250 PS (184 kW; 247 hp) and 350 N⋅m (258 lb⋅ft) of peak torque was available initially, alongside the 2.5-litre TDI diesel unit with 132 kW (177 hp) and 370 N⋅m (273 lb⋅ft) of torque. A variant of the corporate 4.2-litre V8 petrol engine, was made available in 2003, and a less powerful TDI (163 bhp) followed in 2004. Audi stopped production of the allroad in July 2005. Although the model continued to be available for sale throughout 2006 in Europe, there was no 2006 model year for North America. With the return of the "allroad" nameplate to North America, in the form of the 2013 A4 allroad quattro, the C5-Platform allroad quattro has begun to take the name "Ur-allroad." The 'Ur-' is used in the German language, as a prefix to signify 'ancient' or 'early ancestor' (e.g., great-grandmother is Urgroßmutter), and is used informally by car enthusiasts worldwide to refer to the original Audi Quattro that was produced from 1980 – 1991 (the "Ur-Quattro"). The use of the term was then extended to the original S4 and S6 models to differentiate them from later models with the same name; and more recently to the C5 allroad models ("Ur-allroad"). The Typ 4F A6 was released in 2004. Designed by Satoshi Wada in 2001, this model is visually an evolution of the C5, but was lengthened to 4,927 mm (194.0 in), and has the new Audi "single-frame grille". Like other contemporary Audis, the A6 has a "tornado line" that runs from the front lights to the rear lights just below the body shoulders. The C6 iteration of the A6 features more sophisticated technology. Most notable is the Multi Media Interface (MMI), which is a system controlling in-car entertainment, satellite navigation, climate control, car settings such as suspension configuration and optional electronic accessories through a central screen interface. This has the advantage of minimising the wealth of buttons normally found on a dashboard by replacing them with controls which operate multiple devices using the integrated display. On the engines, the new Fuel Stratified Injection (FSI) direct injection technology was introduced. Although the line of engines represents the same progression as the former model, all engines were new. The multitronic continuously variable transmission continues as an alternative for front-wheel drive models, alongside a new six-speed tiptronic automatic transmission available in the four-wheel drive models. Audi's "trademark" Torsen-based quattro permanent four-wheel drive is available in most of the lineup, and standard in the most powerful models. quattro is not available on the multitronic variants of the A6, but is available on the manual and tiptronic gear systems. Conversely the tiptronic system is not available on the front-wheel drive variants of the car. The six-speed manual gearbox is available with the 3.2-litre V6 engine, but not for the North American market. The Avant was previewed by the Audi Avantissimo concept in 2001 and arrived during the course of 2005. The A6 allroad quattro made its debut in 2006, and as before, is an off-road ready version of the Avant, available with either a 2.7-litre V6 or 3.0-litre V6 Turbocharged Direct Injection diesel engines, or a 3.2-litre V6 or 4.2-litre V8 petrol engine. This is a long wheelbase version of the A6 sedan for the Chinese market. The vehicle was unveiled in 2005 at the Shanghai Motor Show. The vehicles went on sale in the middle of 2005. Early models include A6L 2.4, with A6L 2.0 TFSI (170 PS) followed shortly after. A6L 3.0 quattro (218 PS) and A6L 4.2 quattro (335 PS) were introduced in 2005. Other models include A6 3.0. The Audi S6 performance variant was introduced in the Frankfurt Motor Show, and produced from early 2006 until 2011. It is powered by a 5.2-litre Fuel Stratified Injection (FSI) V10 engine producing 320 kW (435 PS; 429 bhp) and 540 N⋅m (398 lbf⋅ft) of torque. The S6 reaches 100 km/h (62.1 mph) from a standstill in 5.2 seconds and a quarter mile in 13.5 seconds. Audi announced the C6 series allroad in the spring of 2005 and released it in the summer of 2006. This model was called the Audi A6 allroad quattro (unlike the previous version, which was merely called Audi allroad quattro, with no reference to the A6 nomenclature). The Audi A6 allroad quattro again featured adaptive air suspension and quattro permanent four-wheel drive system. The A6 allroad was powered by a choice of two Fuel Stratified Injection (FSI) petrol engines, a 3.2-litre V6 and a 4.2-litre V8, and two TDI diesel engines, a 180 PS (132 kW) 2.7 L and a 225 PS (233 only in the US) (162 kW) 3.0 L. The tiptronic gearbox is standard on the 4.2 V8 and the 2.7 TDI, but optional on the 3.2 FSI and 3.0 TDI. The 6-speed tiptronic transmission system converted high-torque engine power into both sporty performance and operating convenience, with crisp, fast gear changes. Advanced electronics respond efficiently to all driver input in both D (Drive) and S (Sport) programmes, helping to prevent unwanted upshifts when cornering. The five-mode air suspension can be raised by up to 60 mm (2.36 in) to provide ground clearance of 185 mm (7.28 in) which is better than the older four-mode. The car featured a number of off-road styling cues including larger bumpers and sills. In some European markets, this A6 allroad quattro was more expensive than the larger Audi Q7, but air suspension is an expensive option in the Q7. In its native country, Germany, it cost a few hundred Euros less than the Q7. In 2005, the A6 won the World Car of the Year award, and has also won the Practical Caravan "Towcar of the Year" awards, due to its array of towing features such as adjustable suspension height and damping, and the presence of a 123 Trailer Stability Programme. Audi unveiled a facelifted "C6" Audi A6 on 12 August 2008, at the Moscow International Motor Show. The refresh incorporates some modern Audi design cues to keep the A6 current with the rest of the Audi lineup. There are minor cosmetic changes to the front and rear lights which now have daytime running LEDs, the taillights extend towards the center of the trunk lid and pinch off at the license plate mount, however their shape remains rectangular compared to the more sculpted light clusters found in the 2008 Audi A5, 2008 Audi A4, and 2009 Audi Q5 (the latter three being all-new generations). The intakes below the headlamps are inspired by the Audi RS5. The A6's six (per side) front light-emitting diode (LED) daytime running lights (DRLs) are located within the main headlamp housing, similar to RS6's placement of the LEDs (ten per side), whereas on the S6 these front LEDs (five per side) are found adjacent to the fog lamps in the lower front bumper. The new front and rear fascias from RS6 would be used on the facelifted A6 and S6 lineup. Also updated for 2009 is the Quattro all-wheel drive setup, which is already found on the 2008 Audi A5 and 2008 Audi A4. This new system features a 40/60 front-to-rear torque split and offers a more balanced feel, reducing the understeer that comes from 50/50 AWD platforms. There are now six petrol and four diesel engines available for the upgraded A6. All petrol engines now feature cylinder-direct Fuel Stratified Injection (FSI) technology, and all diesel engines now feature common rail (CR) and Turbocharged Direct Injection (TDI) technologies. There is a new petrol engine, a 300 PS (221 kW; 296 bhp) 3.0-litre supercharged V6, badged as 3.0 TFSI or 3.0T. This new engine is shared with the 2010 Audi S4 and S5 Cabriolet, although in the latter two applications in a higher state of tune and mated to a 7-speed S-tronic dual-clutch transmission. The new engine and revised quattro system give the 2009 Audi A6 3.0 TFSI almost equivalent performance to the Audi S6 5.2 FSI (which is unchanged except for receiving the cosmetic tweaks like the rest of the Audi A6 lineup). Moreover, the S6 weighs 4,500 lb (2,000 kg) and 59 percent of weight is distributed to the front which increases understeer. US models went on sale as 2009 model year vehicles, and arrived in U.S. dealerships by the beginning of January. Early models include A6 3.2 FSI (sedan), A6 3.0 TFSI quattro (sedan/Avant), A6 4.2 FSI quattro (sedan), S6 5.2 FSI (sedan). The latest version of ultra-high-performance Audi RS6 was launched in September 2008 and produced until the third quarter of 2010. Based upon the V10 engine powering the S6, the RS6 features an all-aluminium alloy 4,991 cc (304.6 cu in) V10 twin-turbocharged, Fuel Stratified Injection engine with a dry sump lubrication system. It produces a power output of 426 kW (579 PS; 571 bhp), and 650 N⋅m (479 lbf⋅ft) of torque, making it the most powerful vehicle ever produced by Audi at the time. This has now been surpassed by the Audi R8. Initially available only as an Avant, the saloon version went on sale in mid-October 2008. The A6L is a longer wheelbase version of the A6 sedan for the Chinese market. The vehicle was unveiled at Auto Shanghai 2009. Early models included the 2.7 TDI powerplant (189 PS). The fourth generation C7 series Audi A6 (internally designated Typ 4G) was launched in early 2011 for the European market and in other markets soon after. It is heavily influenced by the Audi A8 (D4), pulling elements from its exterior details. The A6 shares its interior, platform, and powertrain (Modular Longitudinal Platform) with the Audi A7 four door sedan, which had been released shortly before also in 2011. Compared to the A8 and A7, the A6 has the most aggressive front fascia and LED headlights (optional full LED headlamps). Design work began in 2006, with Jurgen Loffler's exterior design being chosen in 2008. The new A6 increased its wheelbase by nearly 3 in (76 mm) and its width by 2.7 in (69 mm). The redesign also decreased the car's drag coefficient to 0.25. European engine choices for the C7 include two petrol engines – a 2.8-litre FSI V6 with 204 hp (152 kW) and a 300 hp (224 kW), 3.0-litre supercharged FSI engine – and three diesel engines – a 2.0-litre inline four-cylinder and a 3.0-litre turbocharged diesel engine in three states of tune. The European A6 3.0 TFSI will have an optional seven-speed dual-clutch transmission and an air suspension option, two features that will not be available on the United States model. For North America, the Audi A6 3.0 TFSI quattro will be powered by a 3.0-litre supercharged V6 putting out 310 PS (228 kW; 306 hp) and 325 lb⋅ft (441 N⋅m), the same engine carried over from the previous-generation A6 3.0 TFSI, but in a higher state of tune and mated to an eight-speed automatic transmission. For the United States but not the Canadian market, there will be an entry-level Audi A6 2.0 TFSI FrontTrak (front-wheel drive) with a 2.0-litre turbocharged inline-four, the same engine in the Audi A4 and Q5, but mated to the Multitronic CVT (continuous variable transmission). The 2012 model year A6 features all the driver assistance systems from the A8, plus it adds automotive head-up display, active lane assist. Full LED headlamps with Automatic high beam switching or Audi adaptive light (Xenon) with variable headlight range control. Audi unveiled the 2015 C7 mid-life facelift at the 2014 Paris Motor Show. The refresh includes styling tweaks to the car's exterior, engine line-up, transmission and MMI infotainment system with faster Tegra 3 processor, Handwriting recognition, Audi connect Telematics with state of the art 4G mobile internet (and online updates for the navigation map), and advanced Matrix LED headlights. All three TFSI 1.8tfsi and five TDI engines now meet the Euro 6 emission standard. The new TDI Ultra model now comes with glass fiber-reinforced polymer (GFRP) springs and both ultra models now come with S-tronic (dual clutch) transmission. A hybrid electric variant was also available for the first time in the A6, offering a 2-litre TFSI 211 PS (155 kW) engine combined with a 45 PS (33 kW) electric motor. Electric power is supplied via a 1.3 kWh lithium-ion battery, with electric-only range of 3 km for constant 60 km/h (37.28 mph) drive and a top speed of 100 km/h (62.14 mph). The market launch of the A6 Hybrid was scheduled for 2012. However, production of the US model was delayed. The 2013 A6 allroad quattro was launched at the 2012 Geneva Motor Show, along with the 2012 RS4 Avant. Sales began in 2012. The first UK deliveries arrived in July 2012. The allroad model contains several unique features. Audi designed more than 1,100 new, unique parts for the allroad, setting it apart from the standard A6 and making it a true all-terrain vehicle. Most obvious, the allroad received special bumpers and fender flares, giving it an aggressive offroad appearance. The bumpers and fender flares feature a tough-wearing, matte finish, contrasting the rest of the body. The roof received this same coating, as well as four longitudinal ribs for increased strength. The unique bumpers also have integrated aluminum skid plates. The allroad featured larger diameter tires than the standard A6 for improved offroad capabilities. Redesigned headlights, larger side mirrors, and a lack of door "rub strips" are unique to the allroad. The allroad comes standard with an adjustable air suspension system can lift the car high enough to provide 208 mm (8 in) of ground clearance; a low-range mode (an option with manual transmission), absent from other quattro-equipped vehicles, can be selected with the touch of a button. When used together, the two systems made it possible for the allroad to complete an official Land Rover test-course, thus far it is the only car-based SUV that has been proven capable of doing so in testing. Conversely, the air suspension can lower the vehicle down to only 142 mm (6 in) above road level, and simultaneously stiffen the spring and damper rates to provide a sporty driving experience, much like that of the conventional A6 with the sports suspension. German model went on sale in spring 2012. Early models included 3.0 TFSI quattro (310 PS), 3.0 TDI quattro (204 PS), 3.0 TDI quattro (245 PS), 3.0 TDI quattro (313 PS). The A6 L (built in China for the Chinese market as a long wheelbase alternative to the standard A6) was unveiled in 2012 in Guangzhou International Sports Arena. Early models include A6 L TFSI, A6 L 30 FSI, A6 L 35 FSI, A6 L 35 FSI quattro, A6 L 50 TFSI quattro. Available as the S6 saloon and S6 Avant, they included twin-turbo V8 engine rated 420 PS (309 kW; 414 hp) at 5500–6400 rpm and 550 N⋅m (406 lbf⋅ft) at 1450–5250 rpm, recuperation and start-stop systems, cylinder deactivation, Active Noise Cancellation system, seven-speed S tronic transmission, quattro permanent all-wheel drive system with a self-locking center differential and torque vectoring (optional sport differential), adaptive air suspension lowers the body by 10 mm (0.4 in), internally ventilated brake discs (optional carbon fiber-ceramic discs), matte black calipers with S6 logos, 8.5Jx19-inch cast aluminum wheels in a unique five parallel-spoke design (optional seven different 19- or 20-inch wheels (four from quattro GmbH), including 20-inch titanium-look wheels with a five-arm rotor design), 255/40-series tires, Audi drive select driving dynamics system, optional dynamic steering, single-frame grille with aluminum applications and chromed horizontal double bars, exterior mirrors feature aluminum-look housings, S6 sedan with spoiler on the trunk (S6 Avant has a roof spoiler), diffuser on the rear bumper in platinum gray with an aluminum-look offset edge, four elliptical chrome-tipped tailpipes, choice of eight body colors (including exclusive shades Estoril Blue, crystal effect and Prism Silver, crystal effect), body decorated with S6 and V8T badges, leather sport steering wheel with colored stitching, footrest and pedals and soft keys of the MMI operating system in an aluminum-look finish, decorative inlays in matt brushed aluminum (optional carbon, fine grain ash natural brown, layered Beaufort oak), choice of 3 colours for headlining, instrument panel, carpet and seats (black, lunar silver and goa beige (only for the seat upholstery)); Pearl Nappa leather and Alcantara seat upholstery (optional Milano and Valcona leather), height-adjustable sport seats with power lumbar supports and embossed S logos (optional power-adjustable comfort seats with memory function, power-adjustable S sport seats with integrated head restraints). Other options include xenon plus headlights with an all-weather light, LED rear lights, an electromechanical parking brake, driver information system with color display, MMI radio plus includes a Bluetooth interface, Audi sound system with ten speakers, MMI navigation plus (hard drive, an eight-inch monitor, MMI touch input system), 15-speaker Bang & Olufsen Advanced Sound System. The S6 sedan was unveiled at the 2011 Frankfurt Motor Show. 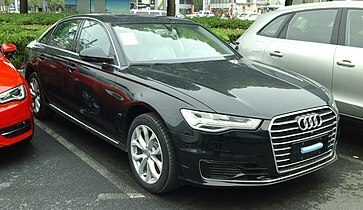 S6 sedan and Avant models went on sale in spring 2012. The concept vehicle was unveiled in Auto China 2012 in Beijing. It is a plug-in hybrid version of A6 L with 2.0 TFSI 211 PS (155 kW; 208 hp) engine combined with a 95 PS (70 kW; 94 hp) electric motor. Electric power is supplied via lithium-ion battery, with all-electric range of 80 km (49.71 mi) for constant 60 km/h (37.28 mph) drive. Other features include MMI navigation plus developed in Audi Infotainment Tech Center (ITC) in Beijing. The series production plug-in hybrid car will be available in China in 2016 on the long-wheelbase version, using the same hybrid vehicle powertrain like the concept vehicle. It has a power output of 180 kW (245 hp), with 500 N⋅m (370 lb⋅ft) maximum torque. All-electric range will be 50 km (31.1 mi). Acceleration from 0–60 mph (97 km/h) takes 8.4 seconds. Fuel consumption will be 2,2 l/100 km (106.9 US mpg). Available in Saloon and Avant bodies, they are versions of A6 S line with 177 PS 2.0-litre TDI or higher engines (excluding S6) in front-wheel-drive or quattro all-wheel-drive configurations, for the UK market. It included 20-inch rotor-design alloy wheels with a dark titanium finish, black grille and number plate surrounds and the window frame strips, and by privacy glass extending from the B-pillar rearwards; black roof rails Piano Black inlays, sports seats upholstered in black Valcona leather, black headlining, BOSE audio system with DAB radio, Audi Music Interface (AMI) for iPod connection. Sales began in November 2012, with deliveries began in early 2013. It is a version of S6 Avant with increased engine power to 560 PS (412 kW; 552 hp) at 5700–6700 rpm and 700 N⋅m (516.3 lbf⋅ft) at 1750–5500 rpm, cylinder on demand system deactivates intake and exhaust valves of 4 cylinders (2, 3, 5 and 8), eight-speed tiptronic transmission with shortened shift times and D and S driving modes, quattro permanent all-wheel drive system with torque vectoring with self-locking center differential with an elevated locking value and oil cooler, adaptive air suspension lowering body by 20 mm (1 in) (optional tauter sport suspension plus with Dynamic Ride Control), option is dynamic steering, four internally vented 390 mm (15 in) diameter brake discs in wave design with a wave-like outer contour (optional 420 mm (17 in) diameter carbon fiber-ceramic brake discs with anthracite gray calipers), black six-piston brake calipers (optional red brake calipers), electronic stabilization control with Sport and off modes, high-gloss 20-inch forged wheels in a seven twin-spoke design (optional 21-inch cast wheels in high-gloss silver, polished black or polished titanium-look), matte aluminum applications on the body, high-gloss black protective grille at the front of the car, the bumpers, the fender, sill flares and the large roof spoiler; rear diffuser with two large elliptical exhaust tailpipes, a choice of 9 body colours (including exclusive shade Daytona Gray matte), dial instruments feature black faces and white dials and red needles, flat-bottomed three-spoke multifunction steering wheel, illuminated entry sills, driver information system (DIS) sport RS logos, RS 6-specific driver information system, footrest and pedals and switches in the MMI navigation plus terminal in aluminum finish, decorative bezel surrounding the retractable monitor in a piano finish, interior door openers in a delicate double-bar design, standard Carbon inlays (with six additional materials as options), standard black headlining (optional Silver or black Alcantara), RS sport seats with side bolsters and integrated head restraints and RS 6 logos upholstered in black Alcantara and leather with diamond quilting at center sections (optional honeycomb-quilted Valcona leather in either black or Moon Silver), optional power-adjustable deluxe seats with memory function, two sportily molded rear seats (optional three-person bench seat), xenon plus headlights, LED rear lights, a tire-pressure control system, illuminated entry sills, custom driver-information system, parking system plus, cruise control, three-zone automatic air conditioning, MMI navigation plus with MMI touch and the 10-speaker Audi sound system. Optional appearance packages (in Matte Aluminum or Carbon) includes customized quattro badges on the central front air inlet. Carbon appearance package includes alternate front splitter and diffuser shapes. Optional Dynamic package increases top speed to 280 km/h (173.98 mph). Optional Dynamic plus package increases top speed to 305 km/h (189.52 mph). Other options include LED headlights with a unique design, the sport differential on the rear axle, Comfort package, head-up display, the high-performance driver assistance systems, Bang & Olufsen Advanced Sound System with 15 speakers and 1,200 watts of total power, Bluetooth online car phone. UK model was available to order from early 2013, with deliveries beginning in next summer. A6L with 2.0 TFSI (180 PS) was sold as A6L TFSI in China. In USA, Canada, UK A6 Saloon with 3.0 TFSI quattro (310 PS) replaced the A6 3.0 TFSI quattro (300 PS). 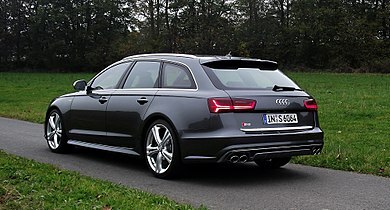 In UK, A6 Avant with 3.0 TFSI quattro (310 PS) replaced the A6 3.0 TFSI quattro (300 PS). For A6 3.0 TDI quattro (245PS), 580 Nm model replaced 500 Nm model in UK. For A6 Saloon 3.0 TFSI quattro (310 PS), 7-speed S tronic is used in UK model, 8-speed tiptronic is used in US, Canada models. A6 3.0 TDI quattro (313 PS) was sold as A6 3.0 BiTDI quattro in the UK. As part of Audi A6 Avant launch in the UK, BBH London, Knucklehead, The Whitehouse, The Mill produced the 'Hummingbird' TV commercial, directed by Daniel Barber. The commercial premiered on Saturday 2011-10-01 during ITV1's coverage of the Rugby World Cup. The commercial was to imagine what a bird designed by Audi would look like and to reflect the car's ultra-lightweight technology. Johann Strauss's 'Open Road, Open Sky' was sung by legendary American baritone and automobile lover John Charles Thomas. In addition, 60 second and 30 versions of the ads were supported by press, print and radio campaigns, as well as a presence on the Daily Telegraph's iPad app. As part of Audi A6 launch in Taiwan, 2011 Audi Fashion Festival featured the theme of 'A6- The sum of Progress', including Shiatzy Chen, Kiki Huang, Robyn Hung and an artistic jewelry brand, Chen Chan. As part of 2013 Audi S6 sedan launch in the US market, 3 different versions of 'Prom' commercial were premiered during 2013 Super Bowl game. The 60-second ad, created by Venables Bell & Partners, features a teenage boy. Voters were to decide their favourite version of the commercial 24 hours on Friday before the Super Bowl game, with winning entry shown on Saturday at Audi's YouTube channel and during the actual game at CBS. As part of RS 6 Avant launch, Audi Land of quattro Alpen Tour 2013 featured RS 6 Avant begins on September 23, travelling across twelve driving stages in 6 countries (Klagenfurt – the capital of Carinthia, Austria, Monaco). In the Audi RS 6 Avant TV commercial titled 'Perfect Fit', it featured a 2012 Audi R18 with the high downforce sprint bodywork in the guise of Audi R18 e-tron quattro. The fifth generation A6 was unveiled ahead of the 2018 Geneva Motor Show. It was launched in Germany in June 2018. All engines offered come with a mild hybrid drivetrain that can reduce fuel consumption by up to 0.7 litres per 100 kilometres for the V6-engined vehicles. The A6 will be offered in 7 new exterior colors and 7 colors which are available in current models. After the C8's introduction, Audi officially stopped production of older A6 and A7 diesel models due to an investigation on newly discovered emissions cheating software. All models will receive 7-speed S-tronic DCT and 8-speed tiptronic automatic. The 2019 Audi A6 made its North American debut at the 2018 New York International Auto Show. The A6 Allroad will be sold in the U.S starting in the fall of 2019. India-The fifth generation of the Audi A6 will be the first generation of the A6 to be assembled and sold in India. It will launch in May 2019. Bangladesh-The fifth generation of the Audi A6 will be the first generation of the A6 to be sold in Bangladesh. According to Dunne & Company, a research company, as of 2011, purchases in China and Hong Kong make up about half of the 229,200 Audi A6s sold in the world. By 2012 many government officials in China began driving with Audi A6s. After a 1994 campaign from the Chinese government to have officials stop driving Mercedes stretch limousines, the officials began using black Audi A6 cars. Michael Wines of The New York Times wrote that "More than a perk, the black Audi is a rolling advertisement for its occupant’s importance and impunity in a nation obsessed with status." ^ a b c d Christian Steinert, The German Car Blog (2006-08-22). "Audi: New sales division in China". The German Car Blog. Retrieved 2010-11-01. ^ "Audi A6 Reference". CarAutoPortal.com. Archived from the original on 2009-10-25. Retrieved 2009-06-22. ^ a b "NHTSA crash test; Audi A6". NHTSA. ^ "Folksam crash testing: Audi A6". Folksam. ^ Kable, Greg. "A6 OPINIONS 'ENCOURAGING'". Automotive News Europe. Crain Communications Incorporated. Retrieved 13 June 2015. ^ "AutoData.bg – Audi A6 A6 (4B, C5) 1.8 (125 Hp)". Retrieved 14 July 2015. ^ "Audi – A6 (4B, C5) – 2.4 (170 Hp) – Technical specifications, Fuel economy (consumption)". Retrieved 14 July 2015. ^ "The 67th Annual Geneva Car Show – 1997". Retrieved 14 July 2015. ^ Anita And Paul Lienert. "1999 Audi A6". Retrieved 14 July 2015. ^ "For safer cars | Audi A6". Euro NCAP. Archived from the original on 15 April 2009. Retrieved 2009-05-26. ^ "IIHS-HLDI: Audi A6". Iihs.org. 2006-03-29. Retrieved 2009-05-26. ^ "2003 Audi RS 6 vs. BMW M5, Jaguar S-type R, M-B E55 AMG". Retrieved 14 July 2015. ^ "Ur-S4 / Ur-S6". carautoportal.com. Archived from the original on 2009-10-25. Retrieved 2009-07-09. ^ "Audi A6 Most Popular German Car – AudiWorld". AudiWorld. Retrieved 14 July 2015. ^ "Learning Alias :: Tutorials". Retrieved 14 July 2015. ^ "2009 Audi A6". Autoblog.com. ^ "New Audi A6 presented as a Long-Wheelbase version exclusively for China". AudiWorld.com. 2005-03-08. Retrieved 2009-02-03. ^ "Audi A6 & S6 Reviews & Specs". JB car pages. ^ Tan, Paul. "New Audi A6 range updated for the 2009 model year". Paultan.org. Retrieved 2010-11-01. ^ Prestige quattro. "2010 Audi S6". Edmunds.com. Retrieved 2012-03-24. ^ Chris Shunk. "Audi Prices A6/S6 starting at $45,100/$75,900". Autoblog. Retrieved 14 July 2015. ^ "Audi RS6 Sedan unveiled: details and photos". Paul Tan's Automotive News. Retrieved 14 July 2015. ^ "[09上海车展]奥迪将携多款首发车型亮相车展". Retrieved 14 July 2015. ^ Xavier Navarro. "Audi tries again to convert Chinese to diesels with new A6L TDI". Autoblog. Retrieved 14 July 2015. ^ "The Audi A6 pickup truck from China". ^ "Meet the Audi A6 pickup truck from China". ^ "Audi A6L Pickup Trucka". ^ "For safer cars | Audi A6". Euro NCAP. Retrieved 2009-05-26. ^ "IIHS-HLDI: Audi A6". Iihs.org. 2008-11-25. Retrieved 2009-05-26. ^ "Roof strength evaluations: Large luxury cars". Iihs.org. Archived from the original on 8 August 2010. Retrieved 2010-09-14. ^ "The Job – Automotive Engineer". Archived from the original on 2015-07-15. Retrieved 14 July 2015. ^ "New Audi A6: Design Gallery". Retrieved 14 July 2015. ^ "2012 Audi A6". Autoblog.com. ^ "Leaked Photos Give Audi A6 an Early Reveal". Automoblog.net. 2010-11-30. Retrieved 2010-12-04. ^ Harley, Michael. "2012 Audi A7". Autoblog.com. Retrieved 2012-03-24. ^ a b "New Look, New Future, New Audi A6". AudiSite.com. 2010-12-04. Archived from the original on 22 December 2010. Retrieved 2010-12-04. ^ Roy, Rex. "First Drive: 2012 Audi A6". Autoblog.com. Retrieved 2012-03-24. ^ Audi Communication (2014-09-04). "Audi A6". AUDI AG – Audi Communication. Archived from the original on 2014-10-30. Retrieved 2014-10-31. ^ Sebastian Blanco. "Audi reveals new A6, says hybrid version is on the way". Autoblog. Retrieved 14 July 2015. ^ Energy Efficiency & Renewable Energy (USDoE and EPA) (2011-06-28). "Upcoming Hybrids". Fueleconomy.gov. Archived from the original on 23 July 2011. Retrieved 2011-07-18. ^ Sebastian Blanco. "Audi delaying A6 hybrid and diesel models, A8 hybrid". Autoblog. Retrieved 14 July 2015. ^ "Audi A6 Hybrid dropped from line-up - 47% built are in Malaysia". Paul Tan's Automotive News. 2014-10-25. Retrieved 2018-11-09. ^ "Low demand forces Audi to kill the A6 Hybrid". Motor1.com. Retrieved 2018-11-09. ^ Noah Joseph. "Audi releases new A6 Allroad... with no word on U.S. availability". Autoblog. Retrieved 14 July 2015. ^ "【奥迪车型新闻】奥迪天地 > 一汽-大众奥迪官网". Retrieved 14 July 2015. ^ chinanews. "ȫ°µA6Lʽ ۼ38.3074.26Ԫ". Retrieved 14 July 2015. ^ Steven J. Ewing. "2012 Audi S6 gets the 4.0 L twin-turbo treatment". Autoblog. Retrieved 14 July 2015. ^ "World Premiere of Audi S Models at the IAA 2011". Audi MediaCenter. Retrieved 14 July 2015. ^ "2013 Audi S6 Debuts at Frankfurt Auto Show". Caranddriver.com. 2012-03-16. Retrieved 2012-03-24. ^ Zach Bowman. "Audi tries hand at luxury PHEVs with A6 L e-tron concept". Autoblog. Retrieved 14 July 2015. ^ "The new Audi A6 L e-tron for China". Audi MediaCenter. Retrieved 14 July 2015. ^ Zach Bowman. "Audi launches Black Edition models in UK *UPDATE". Autoblog. Retrieved 14 July 2015. ^ "Audi releases new A6 and A7 Black Edition versions". SkiddMark. Retrieved 14 July 2015. ^ Jonathon Ramsey. "Your 2013 Audi RS6 has arrived". Autoblog. Retrieved 14 July 2015. ^ "Audi MediaCenter". Audi MediaCenter. Retrieved 14 July 2015. ^ Audi.co.uk. "The all-new RS 6 – the sub-four-second Audi Avant < Latest news < About Audi < Audi < Audi UK". Audi UK. Archived from the original on 15 July 2015. Retrieved 14 July 2015. ^ "Ad of the Day: Audi". AdWeek. Retrieved 14 July 2015. ^ The Mill. "The Mill". The Mill. Retrieved 14 July 2015. ^ "BBH & Audi launch charming new campaign to promote A6 Avant – Bartle Bogle Hegarty – Adforum.com". Retrieved 14 July 2015. ^ "JC & Associates Communications, Inc.-case studies". Archived from the original on 4 April 2015. Retrieved 14 July 2015. ^ Jonathon Ramsey. "Choose your own adventure in Audi's next Super Bowl commercial". Autoblog. Retrieved 14 July 2015. ^ "Audi's Super Bowl Spot Looks Like A Taylor Swift Music Video For Dudes". Yahoo Finance. 23 January 2013. Retrieved 14 July 2015. ^ "Audi, Coke put Super Bowl ad endings in your hands". Detroit Free Press. Retrieved 14 July 2015. ^ "Audi R18 e-tron quattro Stars in New Audi RS 6 TV Commercial "Perfect Fit"". Fourtitude.com. Retrieved 14 July 2015. ^ "Audi R18 e-tron quattro featured in new RS 6 TV commercial". Motorsport.com. Retrieved 14 July 2015. ^ Capparella, Joey (11 April 2019). "2020 Audi S6 Drops the V-8, but Its Turbo V-6 Attempts to Assuage Us with More Torque". Car and Driver. Retrieved 11 April 2019. ^ "The 2019 Audi A6 raises the bar for luxury car tech". Driving. 2018-03-06. Retrieved 2018-03-07. ^ Performance, Audi RS 6 Avant. "New Audi RS6 Avant Spied With Barely Any Camouflage". Motor1.com. Retrieved 2019-04-17. ^ "2019 Audi A6 review, test drive - Autocar India". www.autocarindia.com. Retrieved 2018-06-23. ^ Wines, Michael. "In China, ‘Audi’ Means ‘Big Shot’." The New York Times. November 16, 2012. Retrieved on March 21, 2014. Wikimedia Commons has media related to Audi A6. Audi 6 Club in Hong Kong. Free membership for owners and enthusiasts of A6, S6, RS6, and A7, S7, RS7.